If you enjoy Spanish food, you will be familiar with paella, the hearty, colourful and flavoursome rice dish, usually served directly on a large skillet brimming with mussels, various types of seafood and saffron. Little do we know that the paella is actually a humble summer dish in Spain, found in food carts and home kitchens everywhere. 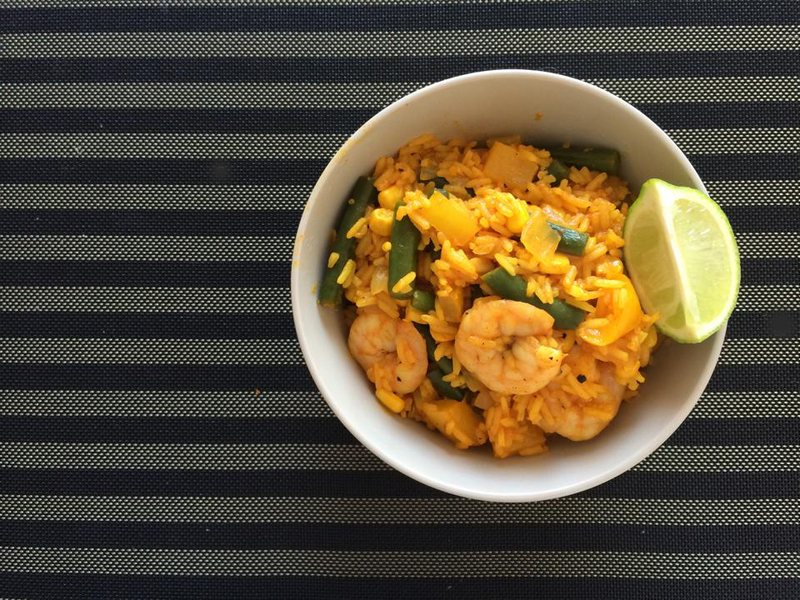 The combination to paella is endless, but the key ingredients remain: rice, protein, capsicum and spices. I used prawn as the protein in this recipe, but feel free to swap it for chicken, beef, lamb or even slices of chorizo. The end result should be a fragrant, slightly spicy rice dish that is a burst of different flavours. The consistency should be slightly drier than risotto, but not as dry as Chinese-style fried rice. Total Time: Prep - 10 minutes. Cook - 35 minutes. 1. In a large saucepan over medium heat, cook prawns in olive oil for 5 minutes or until prawns just turn pink, stirring frequently. Add garlic, cook one minute longer. Lift prawns from pan and set aside. 2. Stir in onion, bell pepper/capsicum, round beans. Add rice. Stir frequently for 2 minutes. 3. Add tomato paste, paprika powder, turmeric powder and stir for one minute until all ingredients are incorporate. Add chicken broth or water and keep stirring for one minute. 4. Bring the mixture to boil. Reduce heat to low, cover and cook for 10 minutes. 5. Stir in the shrimp and chilli flake. Cover and cook for another 10 minutes or until rice is tender and most liquid is absorbed.